This group contains the range of connectors for audio, video and power for devices. All models of this category are highly versatile and suitable for different uses in the field of electronics. A wide range of connectors and connectivity solutions for the automotive and transportation world. Alternative models compatible with major brands on the automotive market. Family of PCB battery holder for cylindrical button-shaped batteries. THT and SMT models. Systems of connections to interface electronic boards, with parallel and right angled solutions. Connectors for THT and SMT. Connectors Card for direct insertion, models for vertical and horizontal insertion; all models have the option of panel mounting flanges. Wide range of circular connectors in plastic version. Screw and quick-coupling versions, IP68 water proof protection, and various configurations for hanging connectors and panel versions. Models with mixed contacts for signal and power. The connectors can be molded or to cabling. Solder or screw termination. Euro-Conn offers a complete range of subminiature connectors, models for cable and PCB and also IDC version. High Density versions and pitch 1.27 mm available. Wide range of accessories from covers to mounting flanges. SMT versions are in the web catalog. HEADER Family composed by male and female connectors for PCB. The range is composed of various models in single, double and triple row, male with single and double insulation, female with insertion from top to bottom; all models can be either straight or bent at right angles. Range consisting of sockets for chip, Dual line and IC Carrier, high and low profile with machined pin or double spring formed. The family also includes single line machined versions, male and female, in different configurations. The range includes the card sockets, too. THT and SMT versions available. Range for PCB and hanging IDC connection for flat cable. The family is completed by models with both male-female connection and direct connection to the PCB. The range of mini-match completes the family of IDC connections. The range also includes the flat cable. This section includes compatible versions of some models of connection on the market. Board to wire connectors pitch 2.00 and 2.54 mm. The range of Euro-card connectors that comply with DIN 41612 completes this section. Series of connection for PCB with machined terminal. This section includes male-male and female versions with insulation height from 2.00 to 7.00 mm. Pitches from 1.27 to 2.54 mm, in single and double row. THT and SMT versions. Connectors board to wire or hanging wire to wire, pitch 6.35 mm. Connectors from 2 to 15 contacts with the following configurations: 2x3-3x3-4x3-5x3. Multiple row connectors for PCB are available only in vertical version and single row, from 2 to 8 positions. Models with male contacts for PCB, single row, are suitable for vertical and horizontal mounting. MICRO 300 Connection board to wire and wire to wire, pitch 3.00 mm, from 2 to 24 way (double row) and from 2 to 6 way (single row). The PCB male connectors are in THT and SMT version for both vertical or horizontal mounting on the PCB. Connection board to wire and wire to wire, pitch 4.20 mm, from 2 to 24 way (double row) and from 2 to 5 way (single row). The PCB male connectors are in THT and SMT version for both vertical or horizontal mounting on the PCB. Hanging housing for cable (male and female)with terminal for cables from AWG 24 to AWG 16. Female blocks with possible retention tabs per panel. Connectors for signal connections for phone and Ethernet; integrated communication systems RJ11-RJ12-RJ13-RJ14-RJ45. 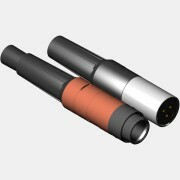 Modular connectors for cable (Plug) Cat.4, Cat.5, Cat.6 and connectors for PCB (Jack), standard plastic and shielded versions. Wide range of RF coaxial connectors for cables (from the semi-rigid and flexible and the types of corrugated copper tube -medium and large size-), mainly used to interconnect equipments and for the supply line, with good electrical features up to 10 GHz. For all versions the input cable is with contact center, crimp or solder type, to meet different needs. The family includes the PCB frets in rectangular and square versions; various sizes available. The catalogue also shows various switches or toggle button. THT and SMT versions. Family of connectors for I / O signal, compliant with the standard Universal Serial Bus. Four versions available: Type A, Type B, Mini, Micro (even in the new 3.0 standard), PCB models in THT and SMT. Models for cable, solder and co-molded with cables of varying lengths and colors on request. Connection system board-wire, pitch from 1.00 to 5.08 mm. PCB connectors In THT or SMT version, single or double row versions with PCB straight and 90° bent. Connectors wire with cable from AWG 32 to AWG 16. FFC and FCP connectors for flat cables: various models (pitch from 0.4 to 1.25 mm). Available with zero insertion force (ZIF) and low insertion force (non ZIF), versions for THT and SMT, straight and 90°. Applicable cables from 0.25 to 1.00 mm. To meet the changing needs of a dynamic market, Euro-Conn created a project section where we offer development and manufacturing of design-in products relating to connections and integrated electromechanical solutions. Mark in the world of connect and industrial connectors distribution.